2 of 5 Place sugar in a medium-size heavy-bottomed saucepan and pour 1/3 cup water over it. Stir to dissolve. Bring to a boil over medium-high heat. Cook, without stirring, for about 10 minutes until amber colored. Pour into a 9-inch glass pie plate; swirl to coat bottom. 3 of 5 Blend condensed and coconut milks, eggs, vanilla and coconut extracts in a blender. Pour into prepared pie plate. 4 of 5 Place pie plate in large roasting pan. Add enough hot water to come halfway up side of plate. Bake at 325 degrees F for 45 minutes, until custard is just set. Transfer to wire rack; let cool. Refrigerate until completely chilled, 4 hours or overnight. 5 of 5 To serve, run a sharp knife around edge of custard. 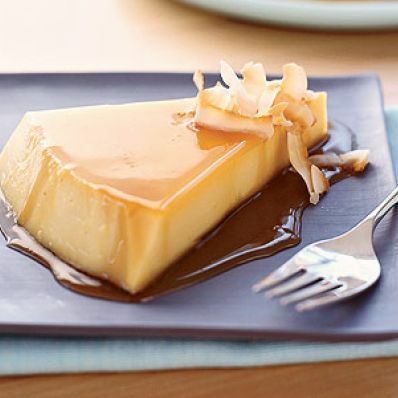 Invert onto a large plate, letting caramel run over top. Garnish with coconut.